How Accurate Are Calorie Counters on Exercise Machines? Although you may feel good after your exercise machine states you have burned a whopping 500 calories in 30 minutes, the numbers are not always accurate. 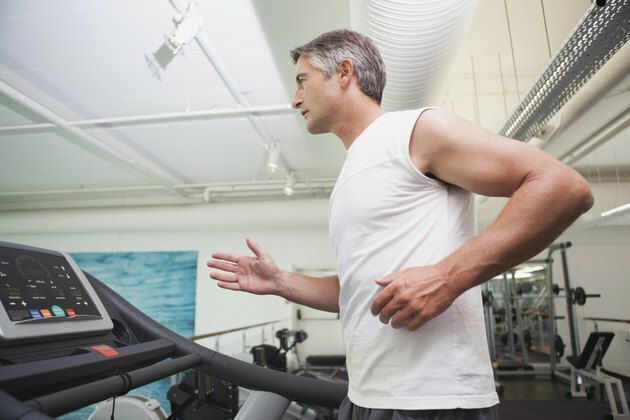 The calorie burned tool on cardio machines such as treadmills, elliptical machines and exercise bikes should only be used as a guideline and not as an exact calculation of energy expenditure. According to Dr. John Porcari from the University of Wisconsin in La Crosse, calorie counters on fitness machines can be as much as 25 to 30 percent over or under your actual burn rate. The numbers returned are an estimate of how much the average person of your same weight burns at your exercise intensity level. Your body composition helps determines how well you burn calories. People with more lean muscle mass will have a higher metabolic rate than those with more body fat. If you weigh 140 lbs. and have 25-percent body fat, you can expect your calorie burn rate to be higher than a person who weighs 140 lbs. and has 35-percent body fat. Most calorie counters on exercise machines do not take this into consideration when calculating results. If you do not enter your weight, the calorie amounts are more likely to be inaccurate. The machine will give results based on the default settings which are typically around 150 lbs. If you weigh more than this amount, you are likely burning more calories than indicated. If you weigh less, your calorie burn rate will be lower. Exercise machines do not take into account certain variables that can affect how many calories you are burning. For instance, if you are holding onto handrails, you are working at a reduced intensity level and burning fewer calories than indicated. Also, if you are not using the machine properly, it can affect the accuracy of the calorie counters. Also, if you have a higher fitness level, you are not working as hard as someone new to exercise and your calorie burn may be lower than indicated.